Life as Pink Einstein | Dallas Fashion and Lifestyle Blogger: Halloween Recap! Halloween this year was probably the best Halloween so far! I attended two Halloween parties, went trick or treating as a group of 30, and collected 154 pieces of candy! And I'm here to give you all the details! For the two parties I attended I went as a pinata! My costume was so fun to make and so fun to wear! For the shirt I cut up different colored felt and glued the strips to a red shirt. I wore red jeggings and red Converse. Around the neck I glued a variety of different candies! I took a dowel rod and glued tissue paper and a pom pom on it to make it the stick you hit the pinata with. For my ears I took some Finding Dory party hats and glued tissue paper all the way around. My costume made for some pretty cute pictures! 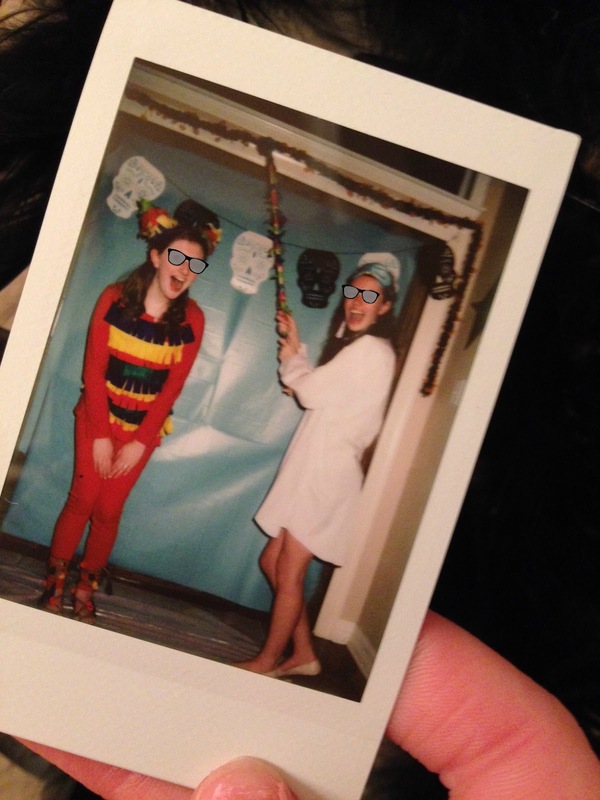 My friends pretended to hit me with the pinata stick! 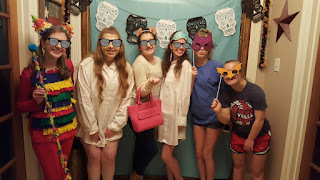 Here is a group of all of my friends at the party! I had to add the glasses because we weren't wearing any and you probably know my mom's rule about wearing glasses in pictures by now! LOL This party was definitely the funnest party I went to. At the party we painted pumpkins and everyone painted their monogram. My friend McCray and I have "visions" that tend to be very similar so she got out her Polaroid and duck boots so we could take pictures of our visions. :) This is my pumpkin I was struggling to do my monogram in the script font so I just did regular letters. My pumpkin was painted coral with gold polka dots and a gold stem. Here is my friend McCray's pumpkin. She did a fantastic job with the fancy lettering on hers but all of her hand writing is pretty and fancy like that so I wasn't surprised. :) Hers was turquoise with coral letters, a gold stem, and pearls. We also bobbed for apples! I didn't because 1. I knew I would be terrible at it and 2. I left right as we were starting. The other party I went to wasn't nearly as fun as the one I just told you about. We kind of just sat around and didn't do much. It was a four hour party and the hostess had only planned out one activity so most people just played on their phones the whole time. The one activity she planned was pumpkin carving which was fun. We were supposed to do it in groups which didn't really happen because I ended up doing most of the work. The pumpkin I did was a Vineyard Vines whale. There wasn't any candles so we used glow sticks. We cut up the glow sticks and splattered them all over the pumpkins which looked really cool even though it didn't last very long. Even though I did all of the work on the pumpkin at the party I didn't get to keep it so I carved another one at home to look like the Vineyard Vines whale. 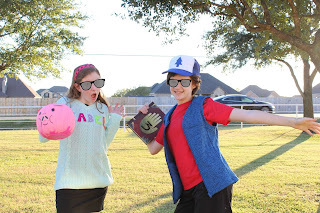 On Halloween night my cousin, sister, and I went trick or treating with a huge group of people and it was a tone of fun!We went as characters from the Disney Channel cartoon Gravity Falls. On the right is my cousin who was Dipper, I am on the left and I was Mabel, and my little sister went as Pacifica. I collected 154 pieces of candy, my sister got 158, and my cousin got 135. I hope everyone's Halloween was just as good as mine was! Comment what you went as for Halloween!